Pattern matching of streaming time series with lower latency under limited computing resource comes to a critical problem, especially as the growth of Industry 4.0 and Industry Internet of Things. However, against traditional single pattern matching problem, a pattern may contain multiple segments representing different statistical properties or physical meanings for more precise and expressive matching in real world. 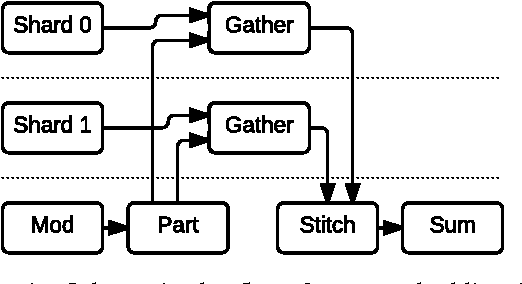 Hence, we formulate a new problem, called "fine-grained pattern matching", which allows users to specify varied granularities of matching deviation to different segments of a given pattern, and fuzzy regions for adaptive breakpoints determination between consecutive segments. In this paper, we propose a novel two-phase approach. In the pruning phase, we introduce Equal-Length Block (ELB) representation together with Block-Skipping Pruning (BSP) policy, which guarantees low cost feature calculation, effective pruning and no false dismissals. In the post-processing phase, a delta-function is proposed to enable us to conduct exact matching in linear complexity. Extensive experiments are conducted to evaluate on synthetic and real-world datasets, which illustrates that our algorithm outperforms the brute-force method and MSM, a multi-step filter mechanism over the multi-scaled representation. 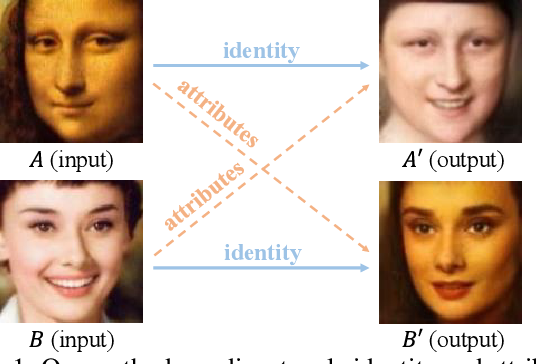 We propose a framework based on Generative Adversarial Networks to disentangle the identity and attributes of faces, such that we can conveniently recombine different identities and attributes for identity preserving face synthesis in open domains. Previous identity preserving face synthesis processes are largely confined to synthesizing faces with known identities that are already in the training dataset. To synthesize a face with identity outside the training dataset, our framework requires one input image of that subject to produce an identity vector, and any other input face image to extract an attribute vector capturing, e.g., pose, emotion, illumination, and even the background. We then recombine the identity vector and the attribute vector to synthesize a new face of the subject with the extracted attribute. Our proposed framework does not need to annotate the attributes of faces in any way. It is trained with an asymmetric loss function to better preserve the identity and stabilize the training process. It can also effectively leverage large amounts of unlabeled training face images to further improve the fidelity of the synthesized faces for subjects that are not presented in the labeled training face dataset. Our experiments demonstrate the efficacy of the proposed framework. We also present its usage in a much broader set of applications including face frontalization, face attribute morphing, and face adversarial example detection. We present variational generative adversarial networks, a general learning framework that combines a variational auto-encoder with a generative adversarial network, for synthesizing images in fine-grained categories, such as faces of a specific person or objects in a category. Our approach models an image as a composition of label and latent attributes in a probabilistic model. By varying the fine-grained category label fed into the resulting generative model, we can generate images in a specific category with randomly drawn values on a latent attribute vector. Our approach has two novel aspects. First, we adopt a cross entropy loss for the discriminative and classifier network, but a mean discrepancy objective for the generative network. This kind of asymmetric loss function makes the GAN training more stable. Second, we adopt an encoder network to learn the relationship between the latent space and the real image space, and use pairwise feature matching to keep the structure of generated images. We experiment with natural images of faces, flowers, and birds, and demonstrate that the proposed models are capable of generating realistic and diverse samples with fine-grained category labels. We further show that our models can be applied to other tasks, such as image inpainting, super-resolution, and data augmentation for training better face recognition models. Distributed training of deep learning models on large-scale training data is typically conducted with asynchronous stochastic optimization to maximize the rate of updates, at the cost of additional noise introduced from asynchrony. In contrast, the synchronous approach is often thought to be impractical due to idle time wasted on waiting for straggling workers. We revisit these conventional beliefs in this paper, and examine the weaknesses of both approaches. We demonstrate that a third approach, synchronous optimization with backup workers, can avoid asynchronous noise while mitigating for the worst stragglers. Our approach is empirically validated and shown to converge faster and to better test accuracies. We propose KDSL, a new word sense disambiguation (WSD) framework that utilizes knowledge to automatically generate sense-labeled data for supervised learning. First, from WordNet, we automatically construct a semantic knowledge base called DisDict, which provides refined feature words that highlight the differences among word senses, i.e., synsets. 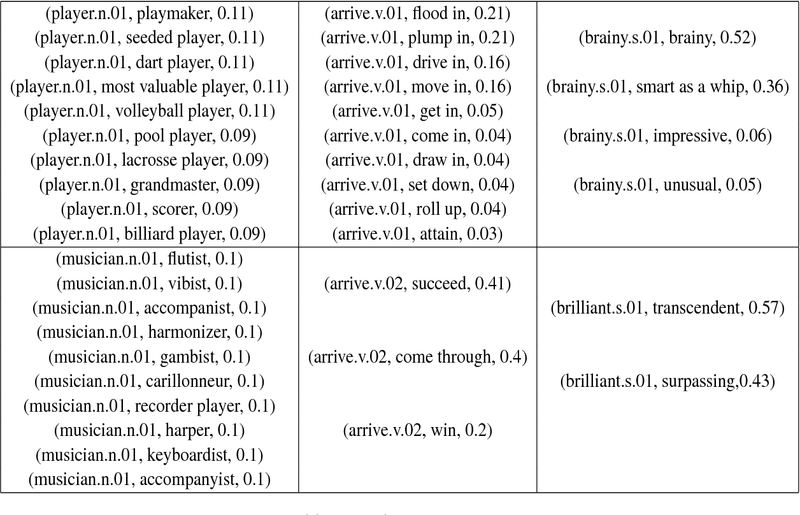 Second, we automatically generate new sense-labeled data by DisDict from unlabeled corpora. Third, these generated data, together with manually labeled data and unlabeled data, are fed to a neural framework conducting supervised and unsupervised learning jointly to model the semantic relations among synsets, feature words and their contexts. The experimental results show that KDSL outperforms several representative state-of-the-art methods on various major benchmarks. Interestingly, it performs relatively well even when manually labeled data is unavailable, thus provides a potential solution for similar tasks in a lack of manual annotations. 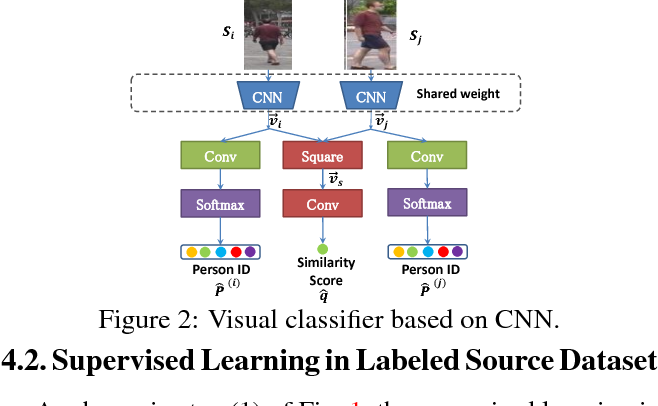 Most of the proposed person re-identification algorithms conduct supervised training and testing on single labeled datasets with small size, so directly deploying these trained models to a large-scale real-world camera network may lead to poor performance due to underfitting. It is challenging to incrementally optimize the models by using the abundant unlabeled data collected from the target domain. 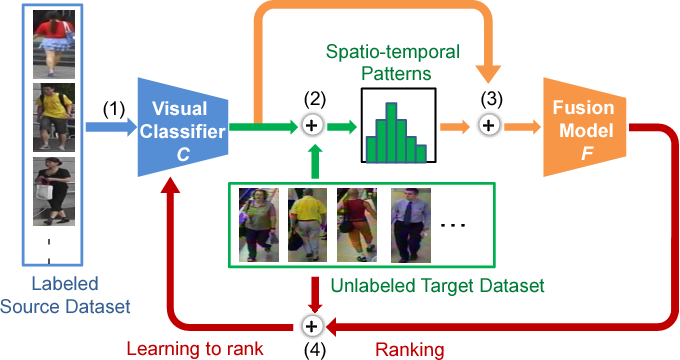 To address this challenge, we propose an unsupervised incremental learning algorithm, TFusion, which is aided by the transfer learning of the pedestrians' spatio-temporal patterns in the target domain. Specifically, the algorithm firstly transfers the visual classifier trained from small labeled source dataset to the unlabeled target dataset so as to learn the pedestrians' spatial-temporal patterns. 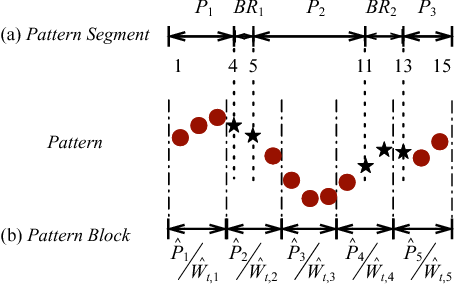 Secondly, a Bayesian fusion model is proposed to combine the learned spatio-temporal patterns with visual features to achieve a significantly improved classifier. Finally, we propose a learning-to-rank based mutual promotion procedure to incrementally optimize the classifiers based on the unlabeled data in the target domain. Comprehensive experiments based on multiple real surveillance datasets are conducted, and the results show that our algorithm gains significant improvement compared with the state-of-art cross-dataset unsupervised person re-identification algorithms.